A new kind of wind turbine captures energy without any blades. It’s half the price, more efficient, silent and doesn’t kill birds. 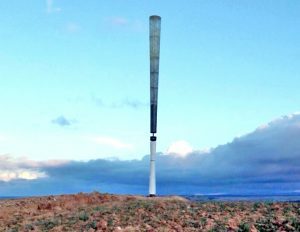 A Spanish company just took wind turbines to the next level by removing their hallmark feature – the blades. 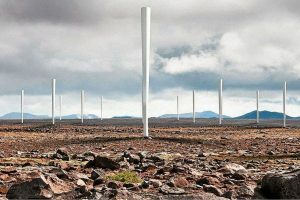 Vortex claims their bladeless wind turbines significantly reduce the carbon footprint of wind energy as they require fewer raw materials, no oiling and far less land as they can be placed closer together. Individually they produce about 3o percent less electricity than a traditional wind turbine, but that is more than compensated for by the fact you can safely fit twice as many turbines into the same space. They also cost around half of what conventional turbines cost to produce. Meanwhile they don’t create noise pollution, don’t block the view, and best of all don’t kill birds. “Instead of capturing energy via the circular motion of a propeller, Vortex takes advantage of what’s known as vorticity, an aerodynamic effect that produces a pattern of spinning vortices,” explains Wired Magazine. Vortex founders David Suriol, David Yáñez, and Raul Martín saw vorticity as an opportunity rather than a threat. “We said, ‘Why don’t we try to use this energy, not avoid it,’” Suriol says. Very interesting article. The main drawback to conventional wind turbines has been that they don’t pay for themselves during the course of their Service Life due to the high cost of installation and maintenance. This version is much more attractive because it’s smaller, has less moving parts, and is easier to install and maintain. Thus making them more Cost Efficient by increasing their numbers per unit of ground, which makes up for the decrease in their Power Output.